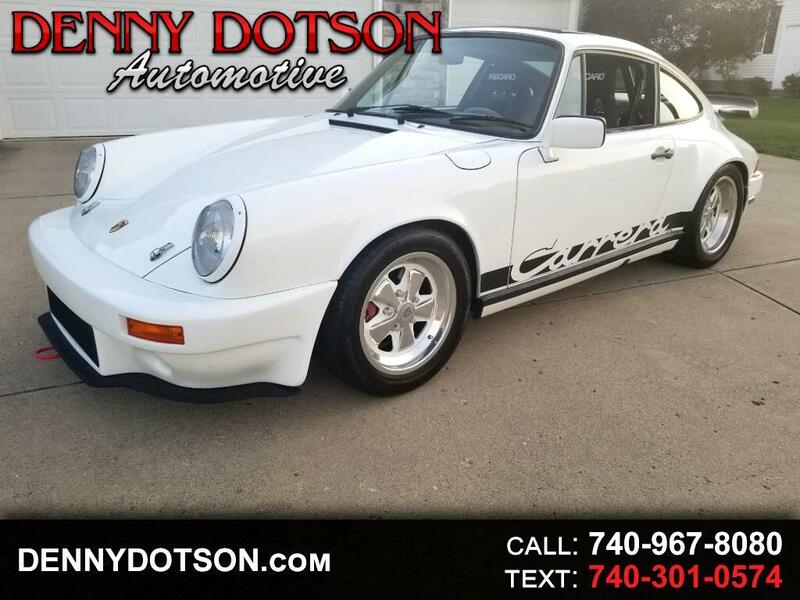 Used 1985 Porsche 911 Carrera for Sale in Johnstown OH 43031 Denny Dotson Automotive Inc.
One of the coolest vintage 911"s on the market today!!! This 1985 Porsche 911 Carrera has been modified for track and street use and is powered by a 3.2-liter flat-six mated to a 5-speed manual transaxle. Has spent the majority of its time in Florida. Finished in Grand Prix White, this 911 has been fitted with upgraded suspension and braking components, a Carrera rear spoiler, Carrera side script, Kevlar bumpers, a roll bar, Recaro racing seats, Sabelt harnesses, and more as described below. The engine and transmission were rebuilt in 2010 and has since only been used for car shows. This Carrera is now being offered with all of the service records since 1996, the original window sticker and manuals, a toolkit, a clean AutoCheck report, and a clear Ohio title. Sunroof, Carrera rear spoiler, and Carrera side graphics in black. Kevlar bumpers are fitted back and front, the latter hosting an added engine oil cooler. Modifications continue with hood pins and Euro taillight lenses. An “R Gruppe” sticker can be seen on the rear window. 16? chrome Fuchs with body-colored accents measure 7" wide in the front and 8" out back. EBS Yellow Stuff brake pads are installed in both the 4-piston front calipers and Boxter S rear calipers. Bilstein shocks have been installed along with Elephant Racing ball joints and 930 tie rods. Sway-A-Way 21mm hollow front torsion bars are paired with 33mm hollow items in the rear. Weltmeister 22mm sway bars are also fitted along with a Stable Energy strut bar. Tarrent Racing camber plates have been added in front, and Elephant Racing camber adjusters in the rear. This 911 has been lowered and corner balanced. The burgundy interior features powered windows but is modified with Recaro racing seats, Sabelt 5-point harnesses, and a 4-point roll bar. A Weltmeister short shifter and Seine Engineering shift gate have been installed along with a Momo leather steering wheel. Aluminum interior trim pieces included instrument surrounds. The 3.2-liter M930/21 flat-six is mated to a 915 5-speed manual transaxle, which was reportedly rebuilt with new synchromesh in 2010. The engine is also said to have been rebuilt with new piston rings, rod bearings, ARP piston rod bolts, 964 head studs, and new timing chains and guide rails. The cylinder heads were reportedly ported, polished, and fitted with EBS dual springs, upgraded valve seals, new exhaust valves, manganese valve guides, GE 20 camshafts, and polished intake valves with a 3-angle grind. An upgraded throttle body was installed and new injectors were reportedly balanced and blue printed. Recent service includes an oil change in August 2018. For a full list of parts please see the pictures and there will be three that show them all. Car made just shy of 300HP. The condition is second to none. Clean history. Over $100K in receipts. Message: Thought you might be interested in this 1985 Porsche 911.